My Halloween Countdown is coming soon! This is just a quick note to say that I will be hosting my annual thirty-one day Halloween countdown here in October. Please watch this space! I'm doing my best to try to make this year's countdown -- the eleventh! -- our most fun and spooky countdown yet. (You can see my past Halloween countdown posts here.) I have a few treats up my sleeve that I hope you'll enjoy. I'm really looking forward to it. I hope you'll plan to join me this October. My niece Kaitlyn is definitely a girl after my own heart. 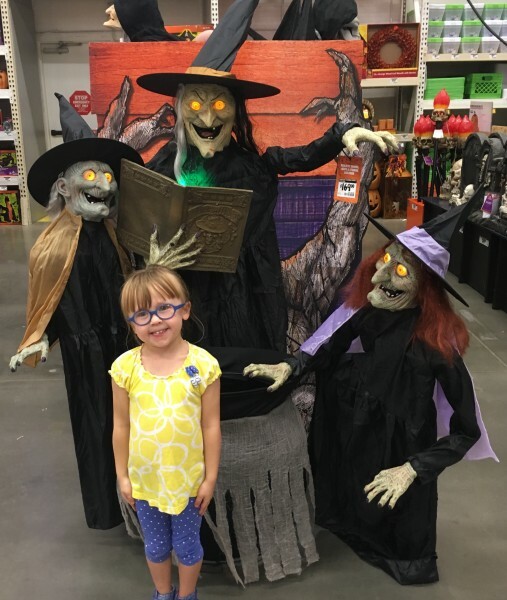 She's already itching for October and seeking out everything Halloween she can find! Yay! I love your Halloween countdowns! Perhaps she can say one day, with Robert Bloch, "I have the heart of a small boy. I keep it in a jar in my desk." You always make Halloween so much fun! Your posts make Halloween last the whole month! Here's a poll question you might try running: Which of these "treats", upon receiving it, would provoke you into egging and/or TPing the offending household? Some possible responses could include Pixie Stix, candy corn, pennies, raisins, popcorn balls, toothbrushes, a lame variety of trail mix, and Fruit Roll-Ups. I realize that a couple of those choices might make you sad, but we must be aware that some Halloween aficionados don't like candy corn.